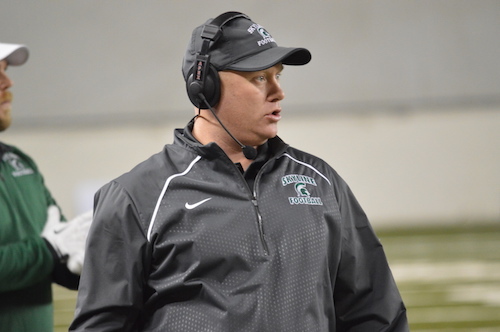 Longtime head coach at Skyline Mat Taylor has his #9 ranked Spartans off to a strong start in the 2016 season. 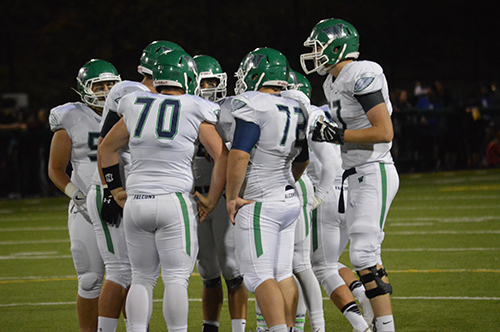 Coach Taylor talks about opening the schedule on the road at Richland and Gonzaga Prep, the home opener at their newly renovated stadium, and some of the top players on this year’s team. Can Skyline navigate through the tough 4A KingCo conference schedule to get back to the championship game and win a record 5th 4A state title with Taylor at the helm? In a classic battle of east against west, the Gonzaga Prep Bullpups traveled 300 miles over the mountains to take on the Skyline Spartans from the Sammamish Plateau. Sparty was fresh off a shootout at the Tacoma Dome a week ago against Lake Stevens which tested them from the opening kickoff to the final whistle. They busted through the gauntlet that was the bottom half of the 4A bracket taking down Gig Harbor, Camas, and the Vikings. 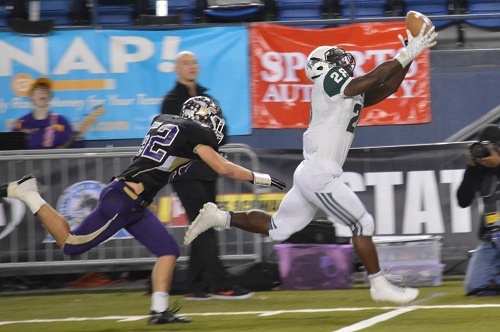 The Bullpups used their staunch defense and efficient offensive attack to navigate to the title game including a grinder in the Tri Cities during semifinal week against the Richland Bombers. 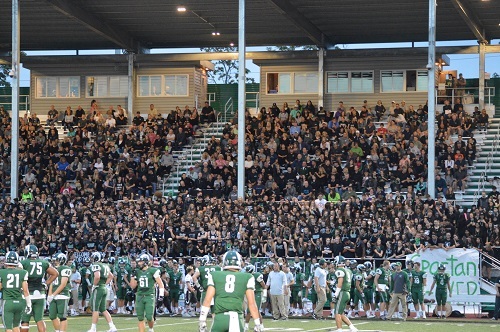 A packed Woodshed was set to close out a fantastic Gridiron Classic. The first few minutes featured a pair of turnovers when an early Bullpup drive ended with a fumble into the Spartan endzone; a big momentum swing that erased what was nearly a quick 7-0 lead. However, the second play from scrimmage following the fumble was picked off by the Pups giving them the ball back in good field position. Later in the first, GPrep struck when Coach McKenna’s trickery caught the Spartans off guard, a double reverse to Devin Culp who glide to the goal line. 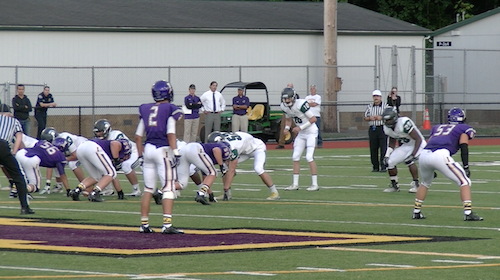 On the ensuing kickoff, Conor McKenna knocked the ball loose from the Skyline kick returner to give his team the ball back in great scoring position. They walked away with three points off the foot of Jared Kutsch. Skyline’s enemic offense continued throughout the first half as they were limited to 102 total yards; the Bullpups had 358 in the same time frame. Before the teams entered halftime, Culp busted loose for a 59 yard rumble to the endzone. Also, the big running back/defensive end combo Evan Weaver capped off a late Bullpup drive to punch it in from a yard out. Many knew Gonzaga Prep had a tough defense, but limiting Skyline to three points in the first two quarters drove that point home on the biggest stage. Trailing by three touchdowns entering the second half, Mat Taylor needed to rally the troops and craft a gameplan to score quickly before a comeback was out of reach. After failing to move the ball into Bullpup territory on their first drive, SHS caught a break by forcing a fumble after they punted. Unfortunately, they turned it right back over on the next play. The ball must have been covered in butter because Skyline forced another turnover two plays later. In 45 second and five plays, there were 3 fumbles! The Spartans took advantage of their gift by setting up Jake Pendergrast for a quick slant route for a touchdown. The Spartans were very much alive! 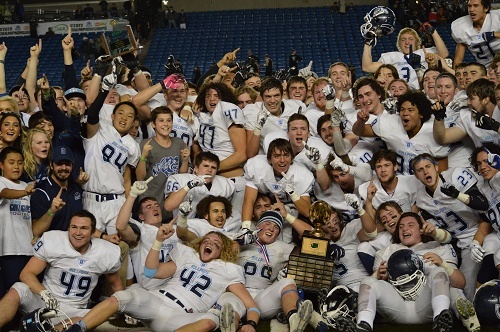 In a series that put a stamp on the contest, Gonzaga Prep drove down the field on a 15 play, 80 yard drive that culminated in a Weaver touchdown to put the Pups up 31-9. Skyline would find paydirt only one more time in the game; a fantastic one-handed grab by Danny Sinatro (see highlight video above). However, this was not enough to overcome the massive lead the Bullpups built early on. When the dust settled, GPHS outrushed their counterpart by 500 yards! Additionally, they dominated the time of possession game by controlling the ball over twice as long as Skyline. A stellar defensive effort by Gonzaga Prep neutralized Skyline’s running attack to only 22 yards. In his postgame comments, Coach McKenna said, “We faced adversity all year long, so when we had to travel over here against a great Skyline team, our kids came out firing.” The 4A crown will head east for until the first week of December in 2016! Football season is back and the first Friday night of high school gridiron action featured a classic KingCo rivalry matchup between Issaquah and Skyline. The Spartans have had the upper hand against their plateau foe for over a decade and the Eagles were primed to turn the tides in front a capacity crowd on the premises of Gary Moore Stadium. A slow pace of play dictated the entirety of the contest as both sides incorporated a heavy dose of passing and short possessions as the ball exchanged hands frequently. After a scoreless first quarter, Blake Gregory found Logan Wanamaker on a long flare down the left side for a big gain. This set up Rashaad Body for a 9 yard scamper to give the green six. Issaquah responded with a scoring drive of their own which closed with a 9 yard tie-toe grab by Joe Nelson from Cameron Humphrey. The scoreboard read 7-7 at the break. The home team picked up an early touchdown in the second half, a 2 yard goal line dive by Bryce Hughes. Minutes later, Sparty responded as Gregory crossed the goal line untouched on a quarterback sneak. The ping-pong match continued when Jack Dellinger hauled in a pass by Humphrey on what appeared to be a defensive misread for 72 yards and a 21-14 lead. Issaquah grabbed a two score lead early in the final frame on another Nelson reception. The Eagles were less than ten minutes from stunning Mat Taylor’s perennial 4A juggernaut. The visitors rallied the troops and drove down the field to set up another rushing touchdown for Boddie. Needing seven to tie the game up and send the game into overtime, Wanamaker did just that on a fourth down conversion with less than a minute remaining. With a complete shift of momentum to the visitor sideline, Buddy Bland needed to rally his team to a score and a stop. They fell short on step one as a field goal attempt did not split the uprights. It was the Spartans chance to complete the comeback and they were faced with a similar predicament. Jack Crane pounded the pigskin through with his big left leg to seal the improbable victory for Skyline. 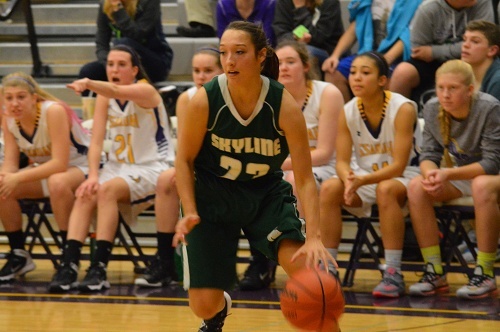 The FinalScore – Skyline 31, Issaquah 28. Game one of a varsity doubleheader on Friday night at Issaquah High School featured the host Eagles and the Skyline Lady Spartans. 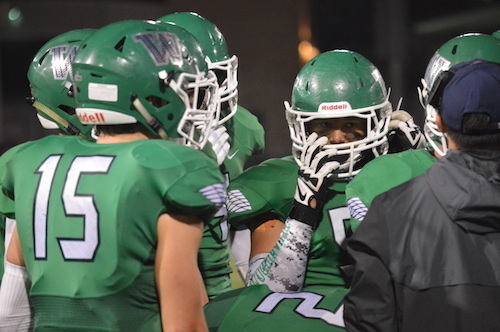 Both teams are jockeying for position in the 4A standings as league play heats up. The victor would take a big step in keeping pace with the KingCo leaders so the table was set for an exciting matchup of plateau rivals. The home squad was able to score eight unanswered points to start the contest and gain early momentum. Coach Fithian was able to rally the troops and respond in a big way. Junior Cassidy Daugherty highlighted a Spartan run by knocking down a pair of triples. At the 2:30 mark in the first frame, Eagle coach Nicole Reid called a timeout to stop the Skyline attack. However, the green and white were on a 16-1 run by the end of the quarter. A strong defensive effort by SHS was led by Jade Loville and Maddie Adamson to help add onto their lead. Issaquah forward Ellen MacNary scored five second-quarter points to keep her team within striking distance. Despite her attempt at sparking a rally, Issy faced a double-digit deficit at the break trailing 32-21. When play resumed, Skyline continued aggressive play by attacking the bucket and earning trips to the free throw line. Their 21/27 (78%) shooting from the charity stripe was a difference maker in the game as Issaquah was unable to get on extended scoring runs. The game was lengthened from the many starts and stops. Lady Spartan captain Taylor McKerlich scored 9 points in the second half en route to her 11 total points and Daugherty led all scorers with 20. Eagle freshman Mariah Van Halm had some nice takes to the cup as she led her team in scoring with 11 points. She helped IHS cut the deficit to single digits in the fourth, but the clock favored Skyline at this point and they were able to run away with the victory as the game came to a conclusion. 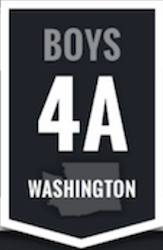 Jason Griffith’s Issaquah Eagles have picked up the ’14-’15 season where they left off last year when they made a deep run in the 4A state tournament. The plateau platoon appears to be a prime contender to raise the hardware in December with a player of the year caliber player and a super sophomore. However, as the new year turns, league play begins and each night on the floor is a challenge. 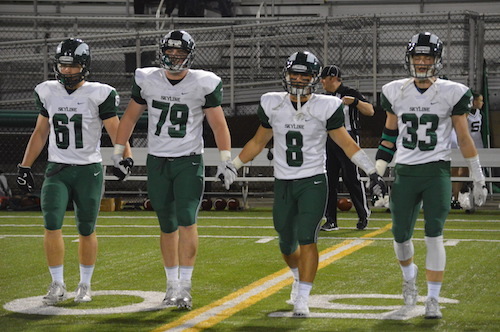 The Skyline Spartans would visit the Eagles’ nest to take a crack at their league rival ahead in the standings. Bill McIntrye had the green and white ready to roll this Friday night. Immediately following the opening tip, Ty Gibson buried a triple from the corner. However, the Spartans responded by matching the early scoring and in doing so, outmatching the home team in the level of intensity on both ends of the floor. A key play early in the contest was a block by Braden Ahlemeyer that sent the energetic Spartan student section into a frenzy. This swat led to a Spartan score on the other end that prompted an Issy timeout to regroup. This proved to be a smart coaching decision because the Eagles started to trim the deficit down and eventually take the lead. When Issaquah took a 27-24 lead at 3:37 in the second quarter, the resolve of Skyline was tested. They passed. At halftime, the Spartans regained the lead at 33-32. When play resumed, more of the same back-and-forth trend continued as there were countless momentum swings and lead changes. Eagle sophomore Trevon Ary-Turner knocked down back-to-back triples to give the purple and white a 45-39 lead midway through the third. But once again, Skyline kept the game within reach. Down the stretch, Sparty realized they played too well to let this opportunity slip. Ahlemeyer knocked down two buckets in the post in the waning minutes. 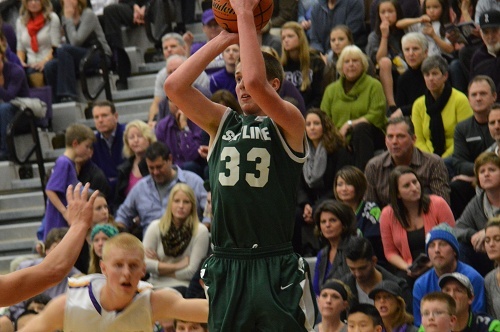 Additionally, Skyline captain Robert Biegaj pulled down a long rebound that led to a layup with twenty seconds left. Leading by four, the Spartans did not allow the Eagles to send this game into overtime and the major upset was complete. Issaquah broke the scoring drought first in the second quarter, a 44 yard pass from senior quarterback Jack Neary to his senior star wide receiver Derek Chapman. The Issaquah sideline exploded as their Eagles took a 7-0 lead. The teams would exchange field goals later in the quarter and Issaquah took a 10-3 lead into half. Skyline coach Mat Taylor had something brewing in that halftime speech, because his Spartans came out ready to play in the second half. 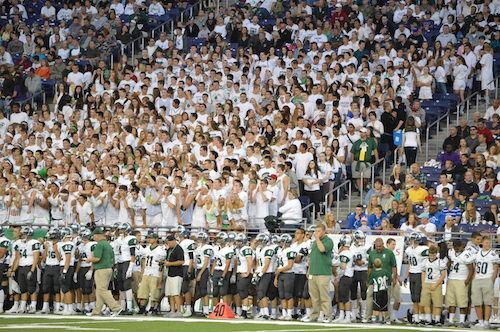 A 27-0 third quarter in favor of the Spartans completely changed the complexion of the game. Touchdowns came from all different avenues; a pass from Kilton Anderson to Derek Loville, two rushing scores, and a special teams score. Issaquah needed a response and succeeded early in the fourth on another strike from Neary to Chapman to cut the lead to 30-17. But Skyline’s defense held tough, with an amazing second half performance from their defensive line to pressure Neary relentlessly. 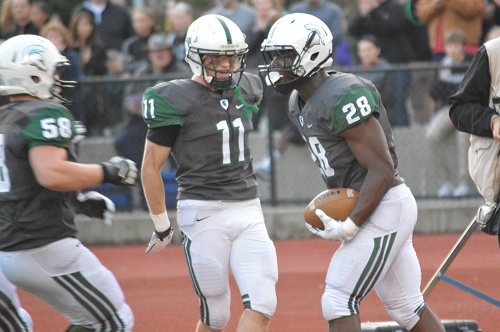 Skyline secured the victory 30-17 and a matchup with the 4A KingCo-Crest champion Bothell. Memorial Stadium was a great site for this KingCo matchup between the Skyline Spartans and the Garfield Bulldogs. The home Bulldogs brought a good amount of noise, but couldn’t match their fans intensity on the field. The first six minutes of the contest saw a fumbling brigade from both teams. The Spartans received and fumbled on their second play from scrimmage. Garfield then fumbled the ball on the next play of the game, and Skyline drove down and scored their first TD on a Kilton Anderson QB keeper to take the lead 7-0. Garfield received the ensuing kick, and fumbled on their next offensive play. Two plays from scrimmage for the Bulldogs, and both resulted in fumbles. Skyline recovered the ball deep in Garfield territory, presumably ready to punch in another touchdown, but they fumbled on their next play and Garfield recovered! Four turnovers, two from each side, in the first 6 minutes of the game! Garfield punted after recovering Skyline’s second fumble and Spartan Elijah Nichols returned it 72 yards to go up 14-0 halfway through the first quarter. Garfield then fumbled the kickoff (too many fumbles, in my opinion) and Skyline recovered deep in Garfield territory. Chandler Wong rushed the ball in for Skyline 3 plays later to take the lead 21-0, still in the first quarter. Anderson would hook up with Wong once more prior to the first quarter end, on a 4 yard TD pass, to take a 28-0 lead. At this point the game was in hand, and the next three quarters of play saw just 20 points total. Garfield did end up getting on the board in the fourth quarter with a QB keeper from Winfred Roberson, to cut the Spartan lead to 34. But that was too little too late, as the Spartans rolled 41-7. 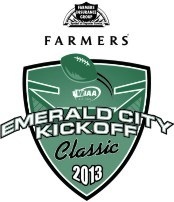 The Emerald City Kickoff Classic nightcap saw the Washington state 3A and 4A champions clash in Husky Stadium. Bellevue has won the past five 3A state championships, and Skyline has won four of the last five 4A state championships, a clear clash of the titans. Bellevue came to play early and seemingly caught the 4A state champs off guard, capitalizing on one costly turnover deep in Skyline’s territory and scoring on two rushing touchdowns in the first quarter. Missed tackles for the Spartans capped off a tough second quarter for Skyline, who found themselves down 35-0 on two more Bellevue rushing touchdowns and one passing touchdown from Timmy Haehl to Marek Spooner. The team speed discrepancy was very apparent from the onset of this game; it seemed as if Bellevue was in a different gear for the first 24 minutes of this contest. Skyline began to move the football more in the third quarter, putting together a couple of good drives and moving into Bellevue territory. The Wolverine defense bent a little bit in the third but did not break, and Bellevue added a field goal in the quarter to go into the fourth up 38-0. Both teams began using reserve players in the fourth, as the game was already well over by half. Skyline managed to get on the board late in the quarter, on a long run by Kilton Anderson. Bellevue also added a touchdown in the quarter, and sealed the victory 45-7.